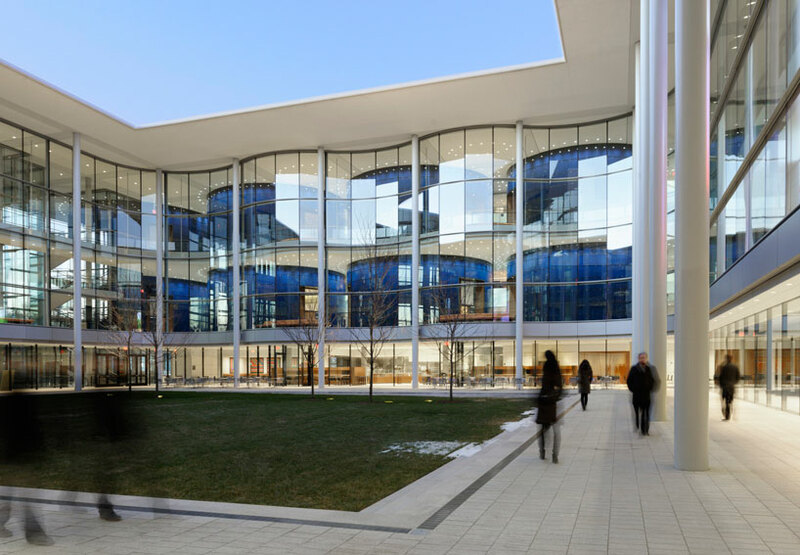 as a former student of the yale school of architecture, lord foster gives back to his alma mater with the completion of a new building for the ivy league institution’s school of management. ‘edward p. evans hall’, brings together for the first time yale’s faculty departments into a single location, providing a high level of transparency to the traditionally enclosed college courtyard, thus creating a green heart for the campus community which is seen from throughout the school. 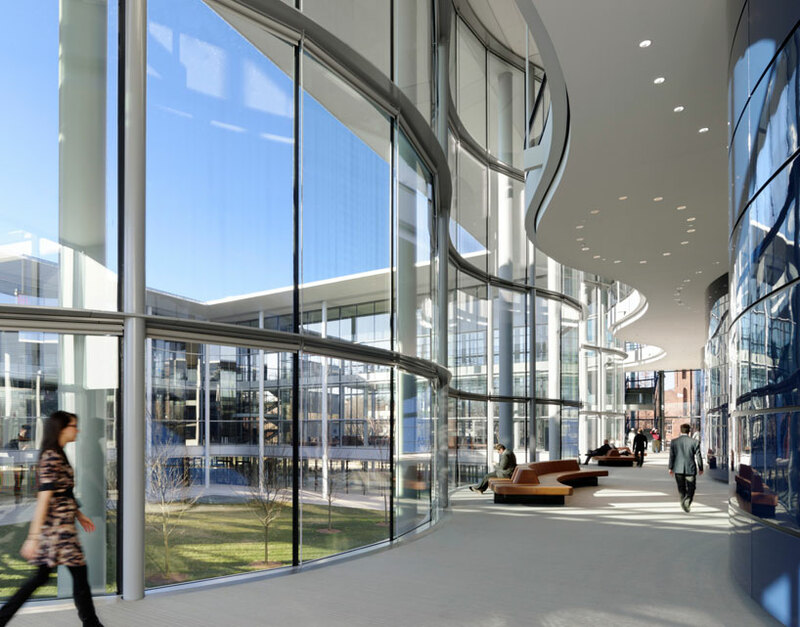 the foster + partners-designed facility was developed in close collaboration with yale’s faculty members. the result is a structure composed of 16 double-height oval drums that frame a central courtyard. standing at five storeys, the scheme puts just as much emphasis on the communal zones as it does the formal teaching areas, incorporating the majority of its social spaces on the ground level, where there is also a coffee shop, media library and large common room. the second floor houses classrooms that are connected by an internal circulation ‘cloister’ – the glazed façade around the courtyard following the undulations of the 16 blue classroom drums, defining window bays where students can sit together outside of lessons, further encouraging collaboration. the third floor is set back from the transparent edifice, forming a mezzanine that offers open sight lines between the various programs and levels of the building. 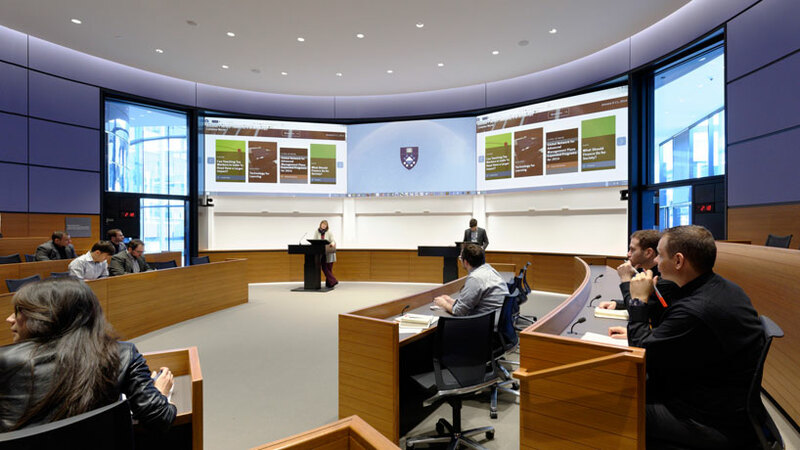 the 16 classrooms are each specifically tailored to yale’s curriculum, and have been conceived to support every style of learning — from team-based working lectures, discussions ‘in the round’, as well as video conferencing. the facility is outfitted with state-of-the-art technology that includes simultaneous translation, filming, multimedia displays and enhanced acoustics, ensuring that every study can be seen and heard clearly. feature programs include the second floor semi-circular beinecke room which provides a flexible events and meeting space that has the capacity for 80 diners, and which is connected to a large curving terrace that offers views looking over the natural landscape to the east. just below the beinecke room one finds a 350-seat auditorium, a venue for hosting yale’s high-profile lecture series. 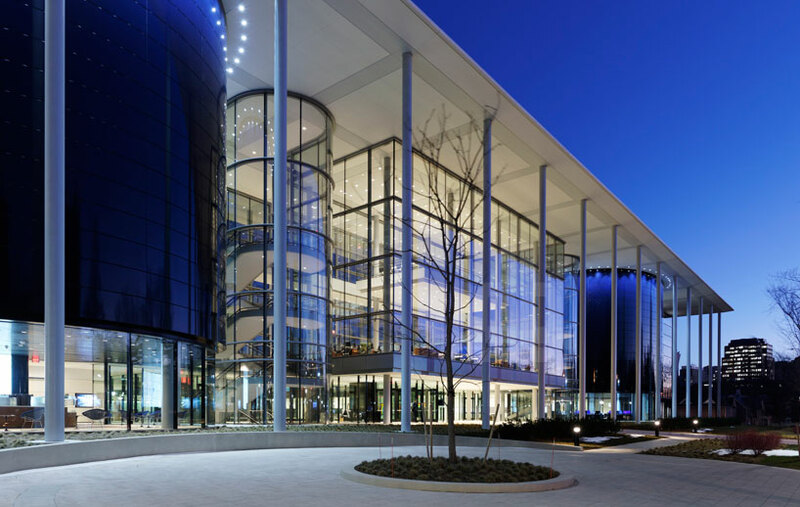 its design is unlike other traditionally closed auditoria, as it retains a visual connection with the courtyard outside. 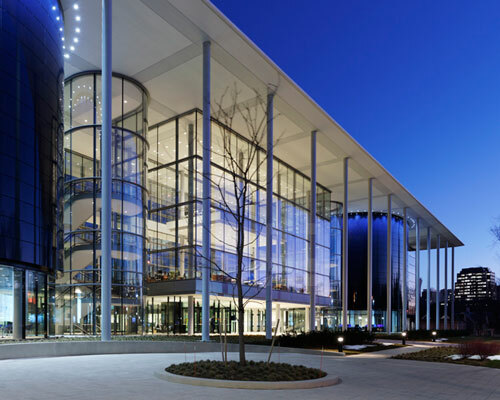 this unlatched approach extends the ‘edward p. evans hall’ to the greater campus, opening it up to whitney avenue, and making visible the feature staircases that are contained within two of the glass cylinders located on either side of the entrance, thus making visible the ongoing activities and liveliness within. the roof is held aloft by slender columns, which stands to shade both the façade and wide entrance plaza below. the realization of the new ‘edward p. eveans hall’ targets the highest environmental standards and responds to the unique climate of its new haven location. chilled beams are set that serve as a displacement system of ventilation and solar shading, complimenting the building’s high performance envelope that employs solar responsive shading that naturally reduces energy demand.